The Bea World Grand Prix 2018 goes to Google Home Training by Laqshya Live Experiences! The prestigious Bea World Grand Prix 2018 goes to an Educational/Training Event from India. This was also the first year of the Best Location Awards, assigned to Valencia Convention Bureau and Finlandia Hall. The perfect ending for a record-breaking edition of a 3-day Festival that gathered the most influential community of event professionals from across the world. November 26th, 2018. The ‘Oscars’ of the events have finally been unveiled. Last Friday night Bea World Festival celebrated its 13th edition awarding the best events of the year worldwide. A parade of excellences shined on the stage of the Grand Auditorium at Convento São Francisco in Coimbra, where over 700 delegates attended the ceremony. The global contest reserved for events and live communication professionals was once again an exceptional opportunity to receive qualified visibility at an international level. After a full day of live presentations and voting, and very intense debate, the Jury Panel led by Gerd De Bruycker, Marketing Director at Cisco Systems was able to proclaim the winners of 2018, a year with three records established: in terms of entries (303 total submissions, +2.4% compared to last year), competing agencies (122, +10.9% compared to 2017) and countries represented (28). Mercedes #24RIDE produced by JAD Productions (Czech Republic) for Mercedes-Benz Cars Ceská Republika got the second place, while the bronze went to Equal Streets, again by Laqshya Live Experiences for Times of India. 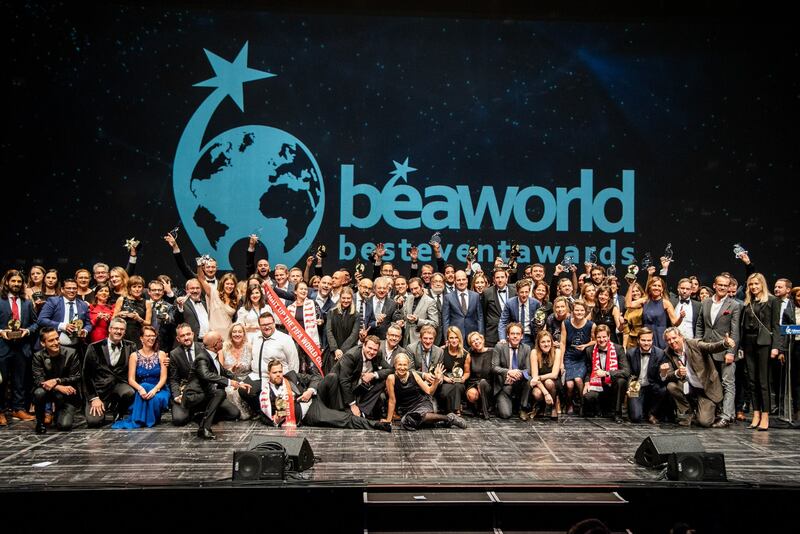 Laqshya Live Experiences also won the title of Best Bea World Event Agency while the title of Best Bea World Corporate Client went to Google and Mercedes-Benz Cars Ceská Republika (ex aequo). The Best B2C Event <€500,000 Marco Category Award went to VM I DØDS – World Championship in “Death Dive” – Belly Flop jumping by 6.Sans (Norway). The Best B2C Event >€500,000 Marco Category Award was assigned to “Light up the FIFA World Cup” experiential activation, produced by Wink (The Netherlands) for Budweiser, Anheuser-Busch InBev, while the Best B2B Event >€500,000 Macro Category Award went to Cisco Live 2018, produced by George P. Johnson (United Kingdom). The Time is Now by The Story Group-Born to Tell Your Story (Italy) for BTicino won a Special Mention for Best Creativity while the Press Award was assigned to Event Horizon 2018 by HiveWise & Media Apparat (Austria) for GridSingularity-Gsy. The People’s Choice Award, assigned through a popular vote carried out via the mobile app, went to the 29th Summer Universiade Taipei 2017 – Opening Ceremony (Taiwan) by Interplan Group (Lead Agency) & Elements Entertainment (Consultant for Creation & Production) for the client Taipei City Government. 2018 saw also the launch of the first ever Best Location Awards. “Our commitment is to increase the culture of events and live communication worldwide, enhancing all aspects of the value chain”, explained Salvatore Sagone, President and Ceo of ADC Group and Founder of Bea World Festival. “For this reason, launched this year the Best Location Awards, aware as we are that the venue and destination play a fundamental role in the success of any event”. A selected Jury comprising senior representatives of national associations of events agencies from around the world thus assigned the title of Best Destination Convention Bureau to Valencia Convention Bureau (Spain) while Finlandia Hall (Finland) won the Best Congress/Conference/Convention Venue Award. Bea World Festival is an initiative by ADC Group and it is made possible thanks to the collaboration of APECATE, the association that gathers and represents the Portuguese companies of Congresses, Events and Tourism Animation, along with the institutional support of Tourism of Portugal, Tourism of Central Portugal and Coimbra City Council. Bea World 2019 will be held in Istanbul, Turkey.